We last heard from Robert F. Kennedy, Jr. when he promoted the whackadoodle leftist meme that the Rethuglicans stole the 2004 election. Not the 2000 election, mind you, but 2004 -- the very year the Kerry campaign bused thousands of out-of-state voters to Wisconsin where they could easily vote early and often in a state with "same day voter registration." 83,000 people executed a same-day registration for Milwuakee County, which is more than 20% of all voting-age residents in the county. Now, Wisconsinites may procrastinate a bit, but in order to believe that number, you'd have to expect that 20% of the county had moved or became newly eligible within the past two years (after the previous national cycle). Not only that, but the state now reports that 10,000 of those registrations cannot be verified, a whopping 12% of all same-day registrations and almost the entire margin of victory for Kerry for the entire state. While RFK's Rolling Stone story is worthy of its own laugh-track, his latest in Vanity Fair is sure to cause giggling even in the rarefied, low-oxygen atmosphere of Kosworld. Robert F. Kennedy Jr. wants to ‘abolish’ carbon usage and sees a direct comparison to the end of slavery. According to Kennedy, “industry and government warnings” about avoiding “economic ruin” should not be heeded because abolishing slavery did not cripple the British economy as was predicted “Instead of collapsing, as slavery’s proponents had predicted, Britain’s economy accelerated,” he argued. 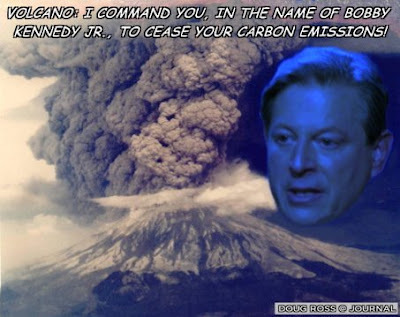 Kennedy didn't describe now the U.S. could eliminate carbon emissions, which will require retooling all automobiles, humans (who exhale carbon dioxide) and volcanoes. Update: Global Warming Insanity looks like a promising new site that will track much of the carbon craziness. Update II: Bidinotto highlights the climate menace represented by the Olympic Torch.